This article, first published by Oxpeckers, and afterwards by chinadialogue, was part of an investigative portfolio that won the China Environmental Press Awards’ Journalist of the Year award. Many locals and wildlife conservation institutions I talked to didn’t even know about the existence of the ivory black market in Okahandja. It was a quiet evening in Zambezi, until a herdsman heard a gunshot in the wilderness. By the time the police arrived, they found an elephant carcass—and the tusks had been taken. Poachers take advantage of this. Since 2011, more than 230 elephants have been reported poached in Namibia, more than 90 percent of them killed in Zambezi. There are indications that Chinese are the buyers behind some of the cases. Despite the anti-poaching messages that can be seen at many places in Namibia, I was frequently approached by locals for illegal deals while I was traveling there. Elephants on the road in northern Namibia. In Katima Mulilo, the capital of Zambezi, I met Booysen Kabula, a 30-year-old resident, through an intermediary. 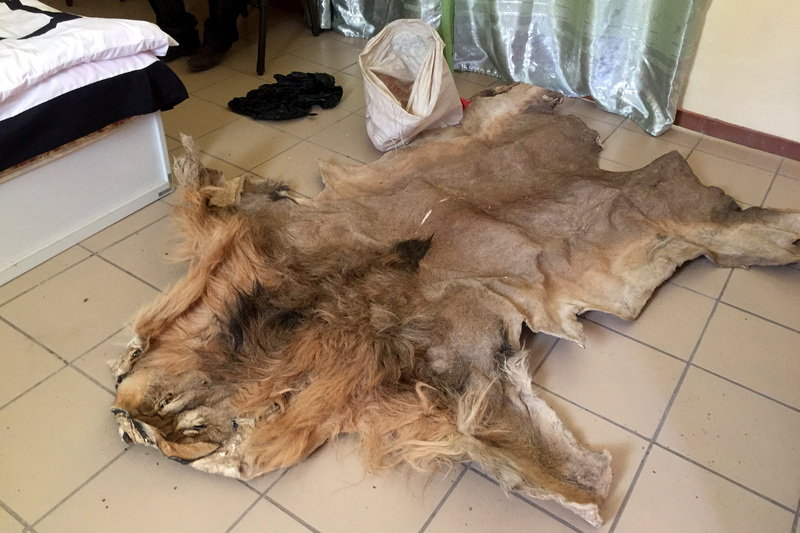 He said he had been looking for a buyer for a lion skin for a while. He also claimed to be able to find any other wildlife products for his clients, including ivory. “It all started when more and more Chinese started flowing in,” said John Kamwi, who works for a local environmental non-governmental organization. I wondered if they had been doing this business for a while. Soon Booysen showed me that he was experienced. He was a frequent guest at my hotel. I was impressed that he knew the rate for every type of room. He said: “If you do this business you don’t want to do it at home, huh?” He shook his head slightly. “Ah, last time I also sold a lion skin to a Chinese. He came from Zambia. That one was U.S.$1,000 [9,558 yuan],” he said. For this one he wanted to charge me 8,000 Namibian dollars (N$), or U.S.$600 (3,930 yuan). According to the United Nations Development Program’s website, 31 percent of the 2.3 million people living in Namibia live on less than U.S.$1.25 a day, and most of the poor live in the north. Some young people leave their village to look for jobs in towns where, they told me, it’s normal for them to make U.S.$50-200 a month. After showing me the lion skin, Booysen said if I wanted to buy ivory I’d have to wait for a couple of days since he needed to get the tusks from friends. “We weigh it, N$500 a kilogram. Usually big ones, people don’t poach small elephants,” he said. Lieutenant General Sh Ndeitunga, the inspector general of the Namibian Police, announced earlier this year that criminal syndicates are recruiting locals to kill rhinos and elephants. He warned that sophisticated organized criminal syndicates are wiping out the country’s wildlife. A policeman combating wildlife crime told me there are poachers and middlemen on the supply chain. The middlemen, often found to be locals or from neighboring countries, hire poachers or simply buy the goods from them, and then sell it to Asian buyers. 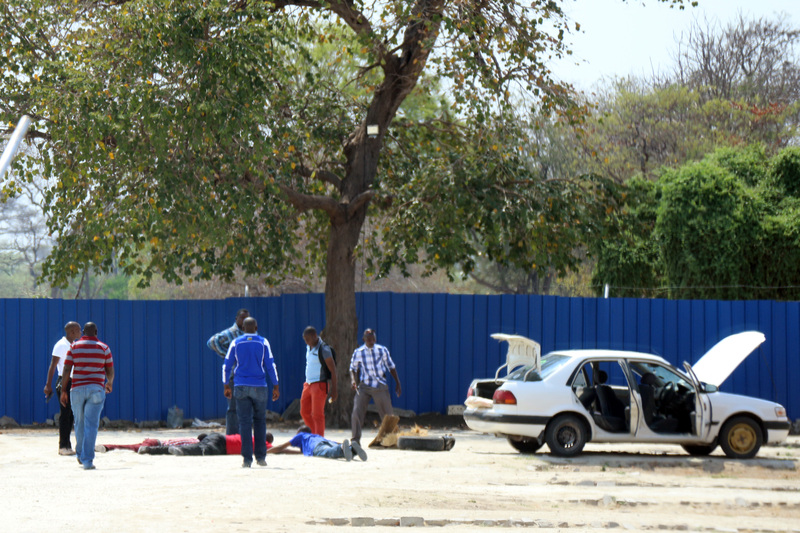 Booysen is a former Katima Mulio policeman, and his alleged accomplices are from Zambia. An ex-colleague of Booysen’s who participated in the arrest recognized him at the site of the arrest. “He quit in 2012 and said he was going back to school,” he told me. Booysen Kabula and two others arrested by the police. 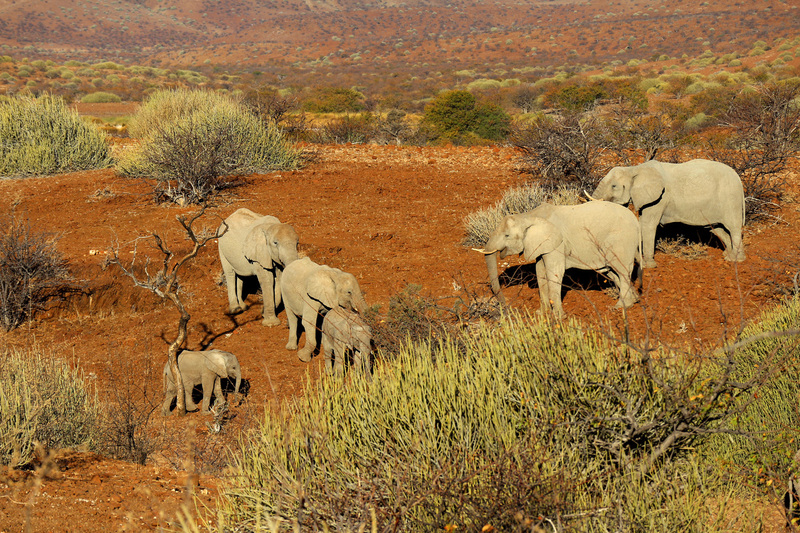 Namibia’s wildlife conservation has long been considered a success story among Southern African countries. Land under structured natural resource management covers 43.5 percent of the country, according to Community Conservation in Namibia. In 2015, up until the end of September 2015, 44 suspects involved in rhino poaching and 17 in elephant poaching had been arrested, I was told by Colgar Sikopo, Director of parks and wildlife management at MET. The poaching surge has swept across Africa. Some analysts believe there were more than 1.3 million elephants in Africa in 1979, but now only about a third of that number still walks the continent. Upon the recommendation of a Chinese businessman, I found a contraband market in Okahandja, a town one hour’s drive away from Windhoek. Although I was warned that the illicit gathering might not reveal itself to an unfamiliar face like mine, I decided to try my luck anyway. Kenny obviously thought Chinese people would like to buy ivory. 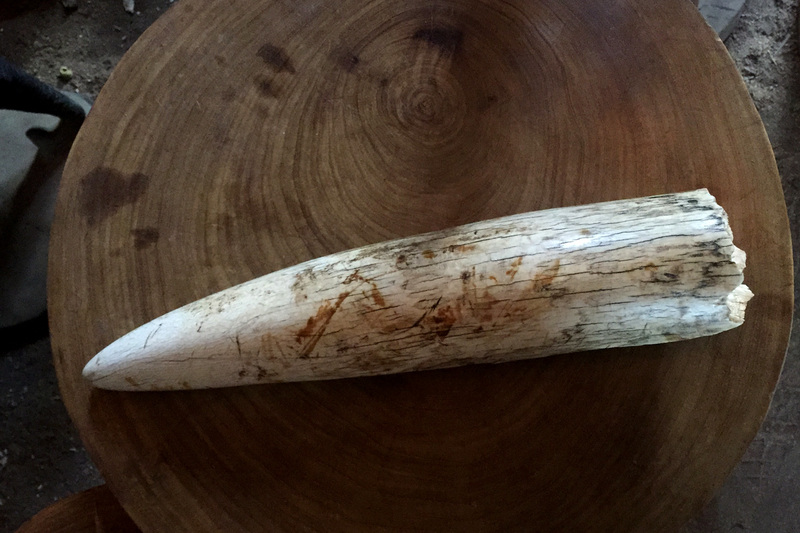 He took out a seemingly broken tusk from an obscure corner of his shop and asked N$8,000 for it. I noticed that Kenny wasn’t shy to talk about his ivory business in the presence of the other peddlers, who were gathered at the doorway trying to solicit a sale from me. 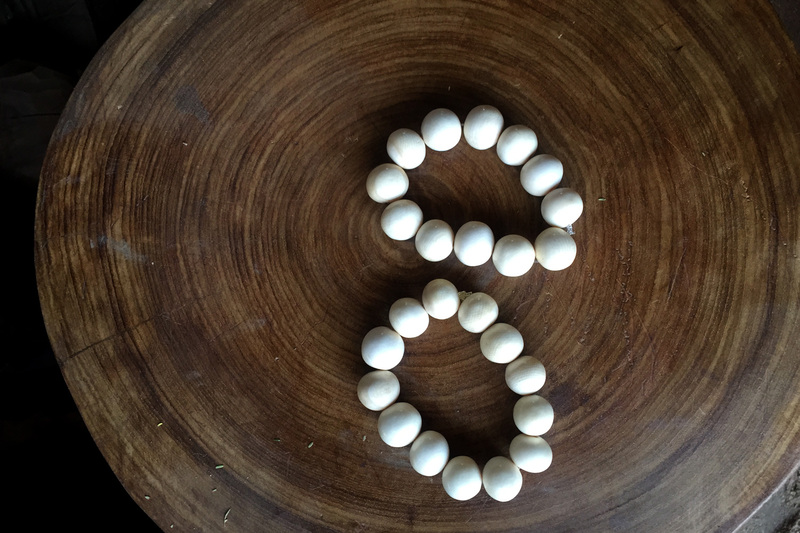 Ivory bracelets in Okahandja market. Kenny’s shop was an important source of income for his family, who were nearly a 1,000 kilometers away from Okahandja. He told me most of his artifacts were handmade by his family. Kenny said he was rarely able to take the day off, not even for the weekend, because he didn’t want to miss any business. I went to the Okahandja market twice in mid and late September. Each time, I was approached by ivory sellers. I took pictures of the ivory products before I ended negotiations with the sellers, saying I doubted if they were real ivory. Sadly, judging from my photos, the anti-poaching organizations I talked to afterwards believed they were the real deal, not fake tusks. Several Chinese people I spoke to said they had been approached for ivory deals in the center of Windhoek. “Just go to shopping malls in the capital. Sometimes they come to you in front of the mall,” one advised. Recent exposure of Chinese involvement in these crimes has intensified locals’ suspicions. I discovered that local police, environment protection organizations, and community workers had all reached the conclusion that Chinese “fortune seekers” in Africa have accelerated the illegal hunting of wildlife. Since Namibia’s independence, its political stability has attracted thousands of Chinese businessmen. They comprise the biggest population among Asian immigrants in the country, and run major wholesale and retail centers dubbed “Chinatowns” in Windhoek and Rundu in the north. In the northwest town of Opuwo, a young couple complained to me that they had been there for five years yet they couldn’t spare the time to travel. The wife recalled, “My husband showed me around a national park briefly once.” And the short trip impressed her profoundly. Working long hours overtime was nothing compared to home robberies. The couple in Opuwo told me that their neighbor, who was also Chinese, had closed up business and moved back to China after a break-in. A Mr. Ma who is in his 30s kindly let me know that because tusks and rhino horns had become too hot to handle, the focus had shifted to less risky things, such as lion nails. In March 2014, three Chinese men were captured at the Windhoek International Airport trying to smuggle 14 rhino horns and a leopard skin. Many Chinese considered this arrest as a signal of strengthened law enforcement and heightened risk. Police evidence indicates that smugglers are taking advantage of the geographical location of Katima Mulilo to transport ivory products and other illegal items to neighboring countries like Zambia, where wildlife law enforcement is relatively loose, and then ship the goods to China. Editor's Note: This, and other reports by Shi Yi, won her the chinadialogue Journalist of the Year award. 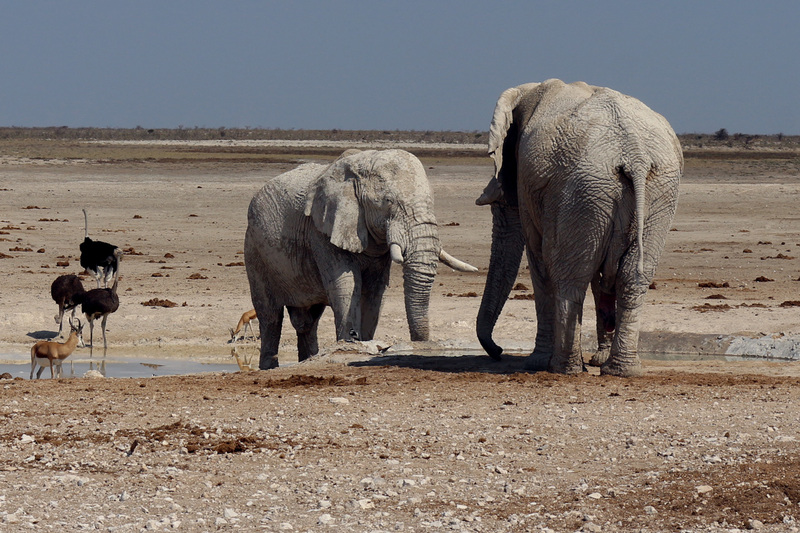 In the southern African country of Namibia, she investigated the illegal trade in ivory, posing as a buyer to make contact with traders of illegal animal products. On publication of her report, local police raided an illegal marketplace. Such reports bolster the international fight against poaching and demonstrate China’s increased awareness of its international responsibilities.